Earlier this year, Fantasy Flight Games released Forbidden Stars. 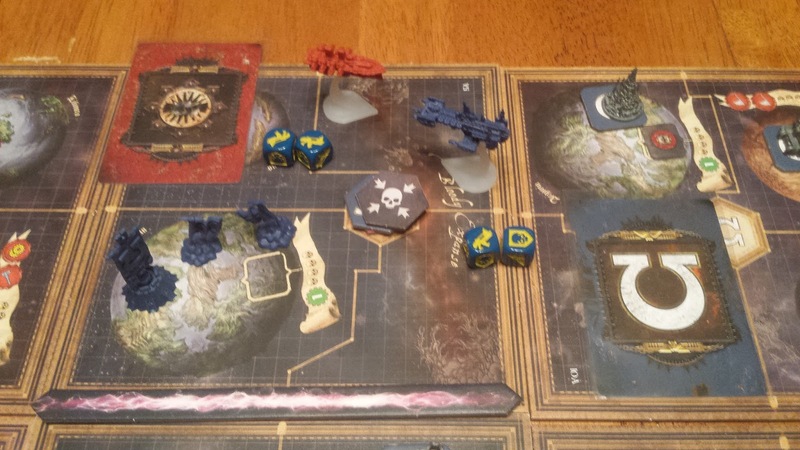 A brand new board game set in the Warhammer 40,000 universe. It has been on my radar for awhile and now that I'm back from U-Con and on a board game kick, I bit the bullet and snagged it. Forbidden Stars is a space warfare game, for 2-4 players. It features four factions from the Warhammer 40,000 universe as they attempt to gain dominance over the newly discovered Herakon Cluster. The factions included in the game are the Ultramarines Space Marine chapter, the World Eaters Chaos Space Marine warband, the Eldar of Craftworld Iyanden and the Evil Sunz Orks. 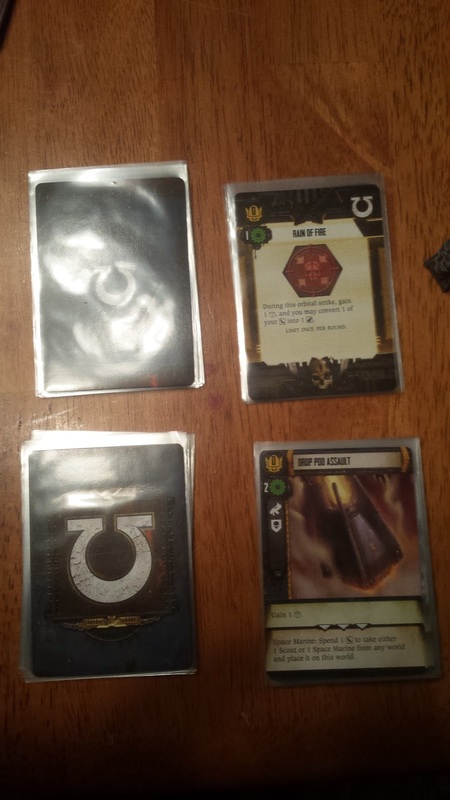 There are a ton of components inside the game box. 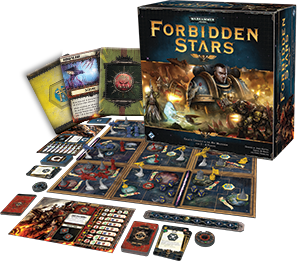 The goal of Forbidden Stars is to collect the most objectives before the end of 8 rounds. 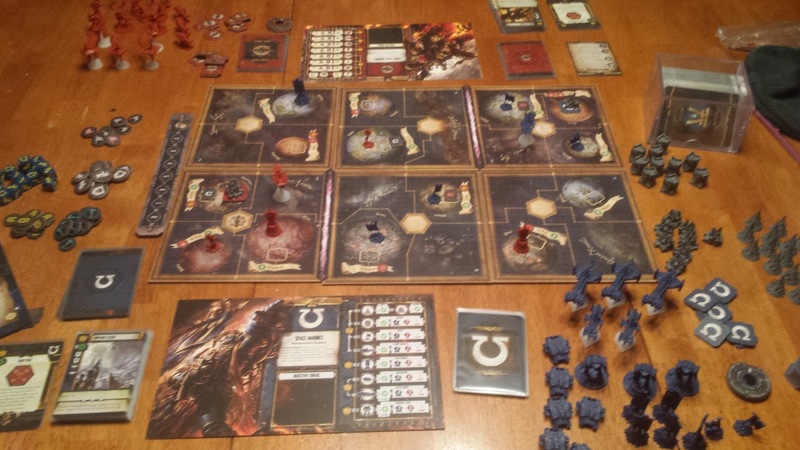 Depending on the game size, each player will have a total of 2-6 objectives on the board. Whoever has captured a total of objectives equal to the number of players in the game before the end of 8 rounds wins. But if the timer runs out, whoever has the most objectives total wins instead. 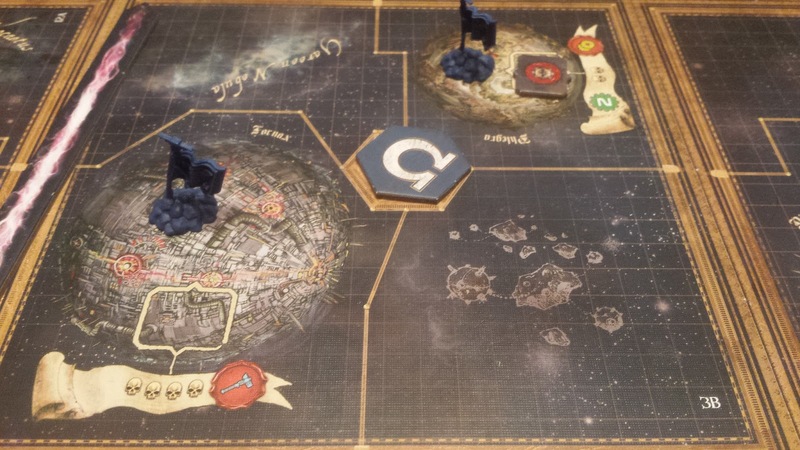 The more players in the game, the more objectives needed to win and the more opposition and threats to your burgeoning empire there are. Not to mention, volatile Warp Storms plague the Herakon Cluster making it even more difficult to collect all of your objectives. The game board is modular and features a collection of 12 double sided tiles. These tiles feature a multitude of different planets and options for layout. Building the game area is part of the game itself too, and you'll have to choose where you want your home world, where your opponent's objectives will be and where your starting forces will be placed as well. Each player controls one of 4 factions. As I said earlier, the factions in the game are the Ultramarines, World Eaters, Craftworld Iyanden and the Evil Sunz. Each of these factions comes with their own assortment of plastic miniatures, 4 decks worth of cards and various faction specific tokens. 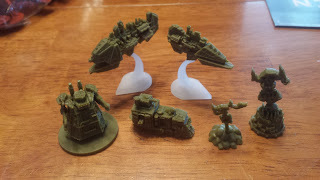 The minis represent different units that you can build over the course of the game. 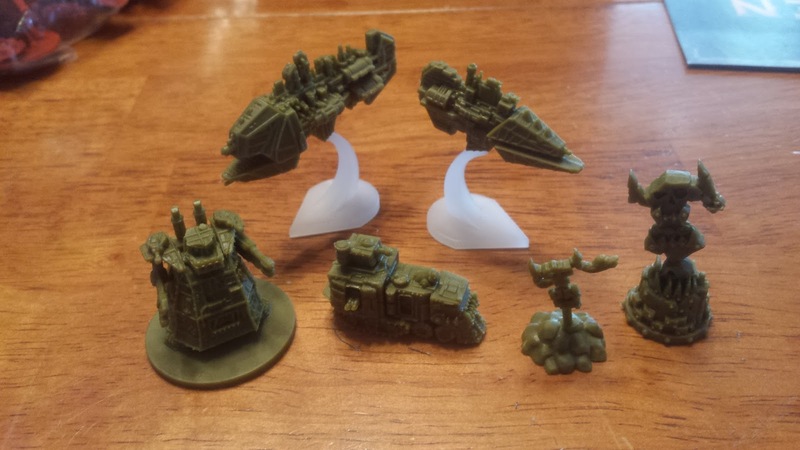 Each faction has a small infantry, large infantry, tank, titan, small spaceship and large spaceship and are all modeled after units from the Warhammer 40,000 universe. Well, except for the infantry units, which are modeled as flags instead of Space Marines or Orks, etc. In addition to the units for each faction, the game includes three types of buildings; Bastions, Cities and Factories. Each of these have different functions within the game as well. Bastions act as protection against orbital strikes and act as an extra unit in ground combat, giving the defender extra hit points to soak up before losing troops. Any planet that has a bastion on it is also immune to orbital strikes, unless a scheme or tactic card allows for it. Cities are let you unlock bigger and better troop types. The more cities you have, the higher your Command Level. The higher your Command Level, the better troops you can buy. Needless to say, cities are key to army building. The highest Command Level is 3, so in order to build the best units, you need 3 cities. Factories are your unit producing buildings. You need to have one in order to build new units in a system and each faction starts out play with one on the board in their home system. You can have multiple factories in play, but you are limited to up to two build orders per turn. 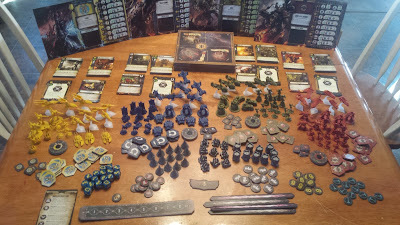 Each structure enters play and is placed on top of a token indicating the faction that owns it. 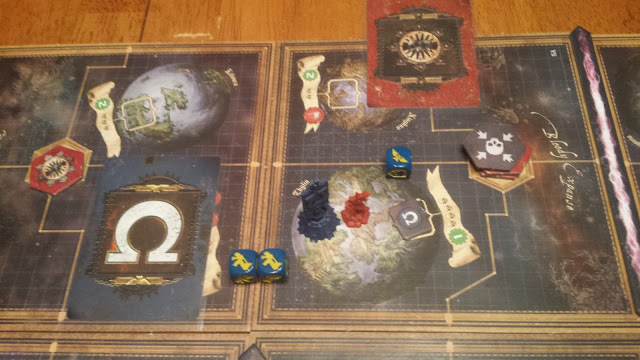 If another faction attacks the planet and wins, ownership changes to the winner. Which means you can target other player's planets and gain their structures to both hinder that player's build capabilities and improve your own. A fully valid strategy. The game is played over three phases. The Planning, Operations and Refresh phases. During the Planning phase, each player takes turns playing action tokens on the different systems of the map. There are four different actions available. Deploy: The player can spend his material to purchase new units and structures in the system. Strategize: The player can purchase an order upgrade, a combat upgrade, or both. Then he places the order token on top of his event deck which will allow him to draw an event card during the Refresh Phase. Dominate: The player gains assets from each friendly world in the system. he can also use the special ability on his faction sheet. Advance: The player can move his units to the system and start one combat. Each of these tokens is placed on the order token box on a system tile. You can also play action tokens atop another player's token, effectively delaying their action until you do yours first. It is entirely possibly that you can lock your opponent out of taking actions until you've done multiple of your own, since it's a last in/ first out system. Or you can attempt to bluff your opponent with a different action, in case they attempt to block it with their own, allowing you to put your true action atop the stack later in the turn order. Playing the stacks and an important part of strategy in this game. It's possible that your opponent will supersede your action. If you're worried about an action happening in a highly contested area, it would be a good idea to wait to lay that action until late in the Planning phase, instead of early. 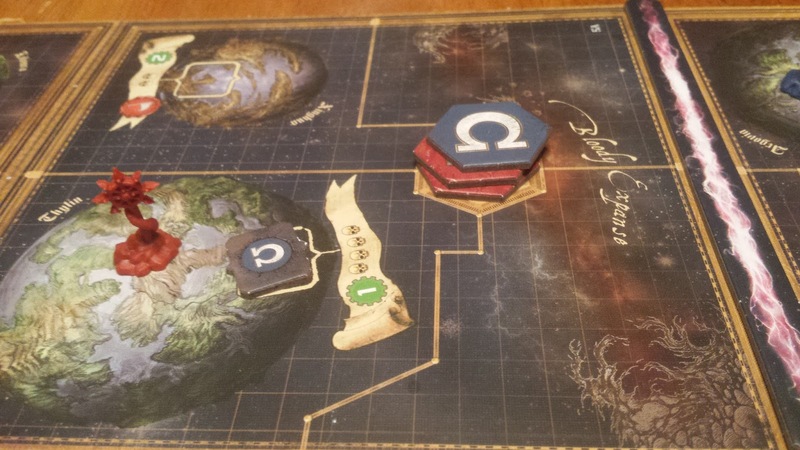 Once each player has set out a total of four tokens the game moves to the Operations phase. The Operations phase is the meat of the game. In the Operations phase each player takes turns revealing their order tokens, starting with the player with the first player token. 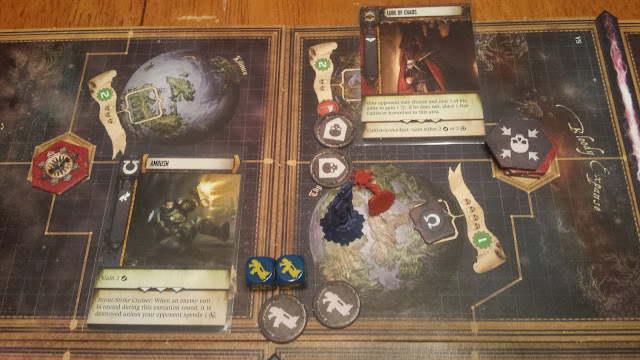 The first player can reveal any one of their tokens on the board, and here is where timing actions comes into play. If you have a couple single actions on the board and one on top of a stack blocking your opponent's tokens, you can pick one of your single actions and keep the stack on lock down until later on the round. If the opponent has multiple tokens on a stack, it's possible to force him to sit through all of your actions. Or if he was planning to build and you charged in with an Advance order, you could even kill off his units before he has a chance to build. Effectively making those Deploy tokens useless. Once the first player has revealed his token and resolved it, play moves to the next player and cycles until all tokens have been revealed. 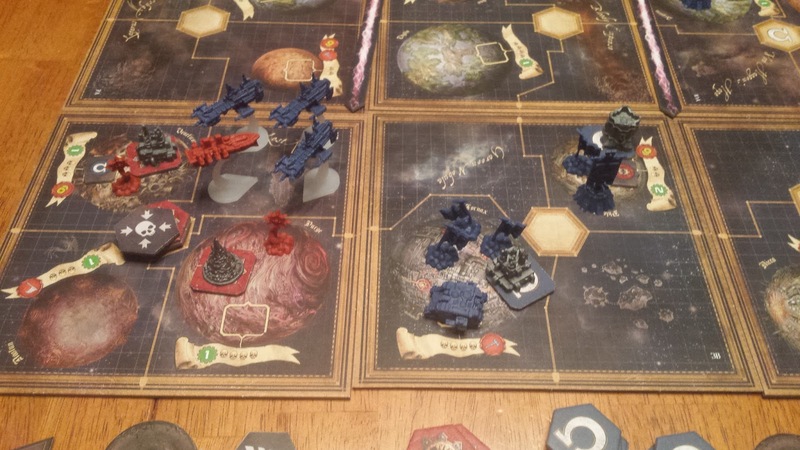 The Advance order allows units of your army to traverse the Herakon Cluster, A player may move their units into an adjacent system starting with spaceships, then ground units. Spaceships must be placed in a Void (any space without a planet in it). Ground units must be placed on planet spaces, but can only move through friendly spaces to get to their destination. For example after moving a ship to a void in an adjacent system. The ground units can draw a path from their original planet, through the ship's void and onto a planet in the new system. If the planet has no other units on it, it comes under your control and is considered "friendly". If an enemy unit is on the planet, it becomes "contested" and combat starts. A player may only initiate a single combat per Advance order. But you can move units to multiple planets on the active system, up to a total of 5 units moved during the Advance order. When a combat starts both players will follow a set of steps to resolve it. I've taken pictures of both a ground combat and aerial combat and will illustrate how a combat works in for both. Combat begins with both players rolling dice based on the combined strength of their units in the combat. Then after shuffling their Combat decks the players draw 5 cards each. These will be used to modify their dice rolls and possibly activate special effects listed on the card. Combat is played over three Execution phases. At the end of the final phase, if neither side is fully destroyed, the winner is determined by Morale. Morale is denoted by the Imperial Aquila symbol and is found on dice, combat cards and each unit naturally provides a set amount of Morale to the result. At the beginning of the first Execution phase, both sides have rolled their dice. 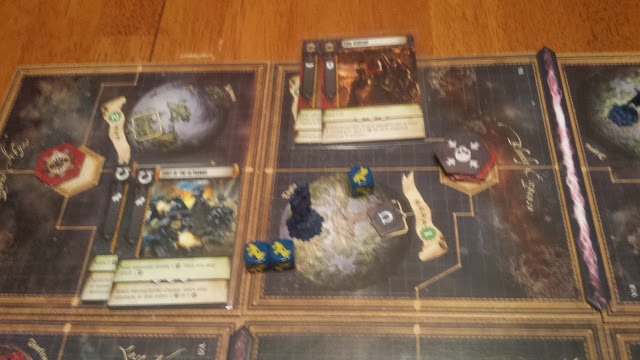 The Ultramarine Space Marine token rolls 2 dice for his attack, while the World Eaters Cultist rolls a single die. 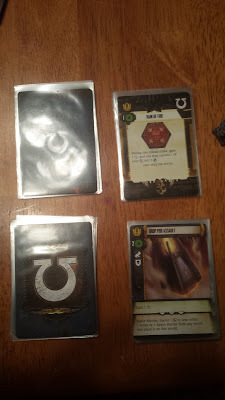 Then both players have played a Combat card face down. The Ultramarine player is the attacker, so he reveals his card first, which is called Ambush. 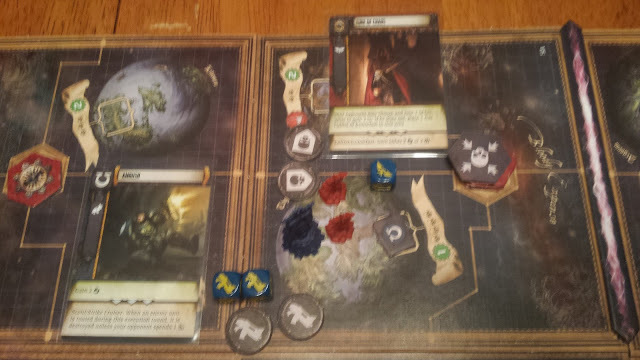 The Ambush card gives him and additional Bolter (seen on the left side of the card) and adds two Bolter tokens to this Execution phase of combat (green box of text). This effectively gives him 5 Bolters, this phase. The tan box of text has a secondary ability, that would have activated, if the Ultramarine player had an Unrouted Scout in play. The World Eater's player plays Lure of Chaos. Lure of Chaos offers the Ultramarine player the chance to Rout one of his units and roll a die. If he doesn't the World Eaters' player gains a Cultist miniature and it's added to the combat. Since the Ultramarine player didn't Rout his Space Marine, a Cultist joins the battle. 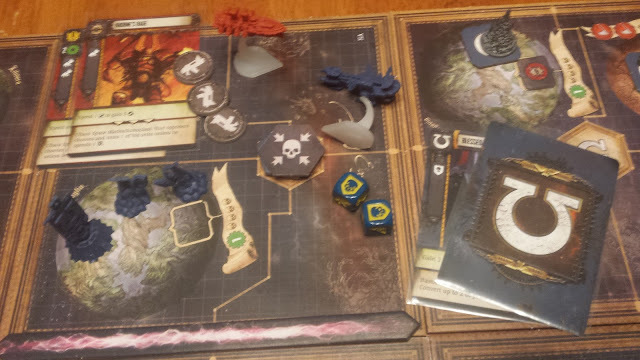 Also, since the World Eater's player has a Cultist in combat, he gains two Shield tokens, upping his defense. With all cards revealed, damage is resolved. The Ultramarines player has 5 bolters vs. 2 Shields, doing 3 Damage. This destroys one Cultist and Routs the 2nd Cultist. The Cultist is now Routed and doesn't count toward card effects that call for Cultists (such as Lure of Chaos' Shield token effect) and wouldn't count towards Morale scoring. The second Execution phase starts and both players play their cards. 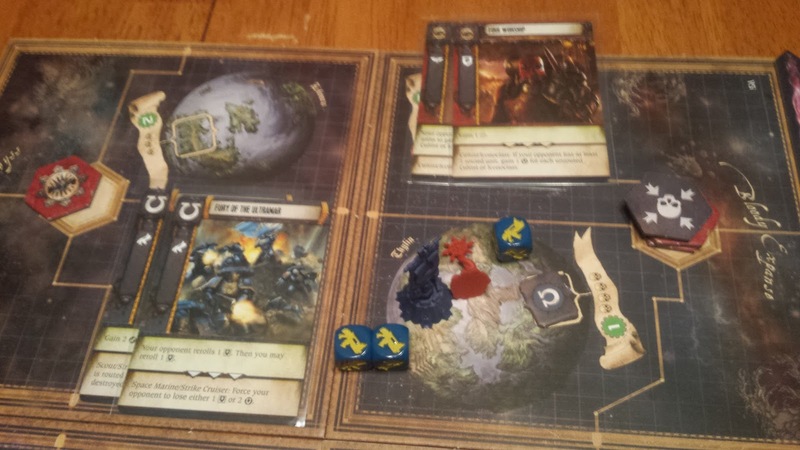 The Ultramarines play Fury of Ultimar, giving them another Bolter. But the abilities on the card are wasted, since the opponent doesn't have any shields. The World Eaters' player plays Foul Worship giving himself and extra die roll, on which he rolled a Bolter. It also gives him a Shield, but thanks to the Cultist being Routed he doesn't get to use the card's secondary ability. 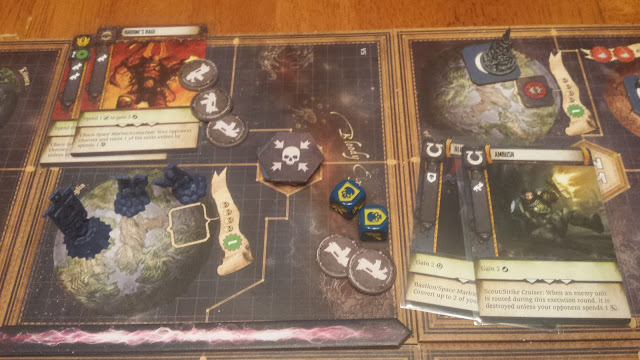 The four Bolters are enough to get passed the Cultist's single Shield and he is destroyed. And since the combat was successful and no one else contested the planet, the Ultramarines score the Objective at the end of the round and it is placed on their dashboard. Next up we have an example of ship to ship combat. Ship to ship combat is handled the same way as ground combat, but is slightly more limited on the units that can partake. In Forbidden Stars there are only two types of ship and a void can only have 3 units in it. So while it is possible to have 6 ships in play, you'll more than likely only have 3 per side in a combat at the most. Especially since you need ships to move ground troops between planets, the chances of having a full armada seem pretty slim to me. Here we have a World Eaters Iconoclast vs a Space Marine Strike Cruiser. Both players have rolled their dice, played their cards and are ready to start the Execution phase. 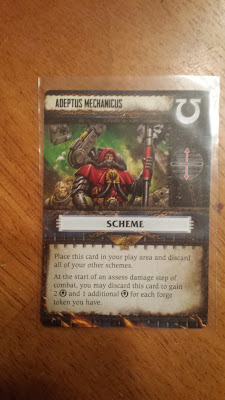 The World Eaters reveal Mark of Khorne, an upgraded combat card, which they bought in an earlier round. 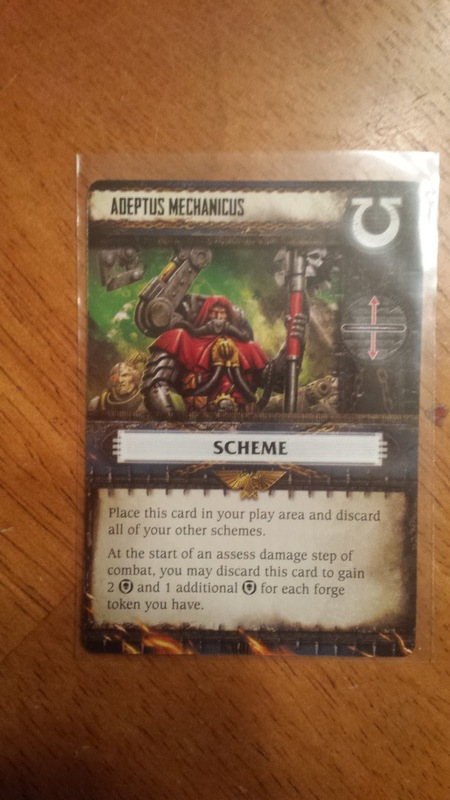 This card gives them two extra Bolters and since they discarded one of their Bolter dice, three Bolter tokens. This gives them a total of 6 Bolter results this phase. Since the Ultramarines have no Routed units, the secondary ability doesn't take effect, so their Shield is safe. Otherwise they would have had to destroy a Routed unit, unless they discarded their Shield die. 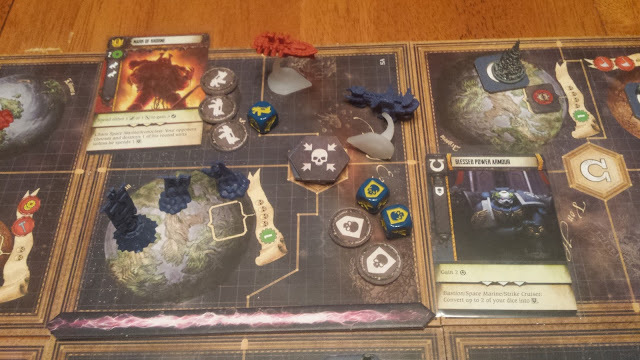 The Ultramarines player reveals Blessed Power Armor, giving him 2 Shield tokens and an extra Shield thanks to the card. He also uses the secondary ability to convert his Bolter die to another Shield die, saving him from destruction. Unfortunately, since he still takes damage the Strike Cruiser becomes Routed. Since he's the only unit the Ultramarine player has in combat, he can no longer be counted towards secondary abilities or morale in this combat. And while normally you can't deal damage to a Routed unit, since the Strike Cruiser is the only target in combat, the Iconoclast can still deal damage to him and possibly destroy it in later Execution phases. 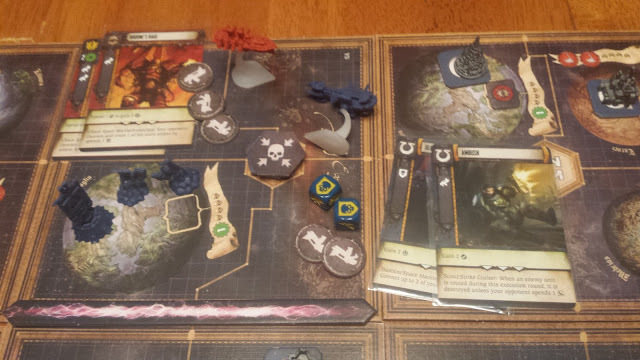 At the start of Execution round two, the Chaos player reveals Khorne's Rage, giving him another Bolter result and 3 new Bolter tokens. The Ultramarines player reveals Ambush, which gives him 2 Bolter tokens and a Bolter result from the card, giving him 3 Bolters as well. So that's combat. At first I thought it was confusing, but after fiddling with it for a bit it ended up clicking and making a lot of sense to me. results it counts as. Those side bar add ons can make a big difference in a combat. Especially if you're defending and out numbered. There are also card abilities that allow you to add in new units to the combat, effectively giving you more hit points to out last your opponent until you reach a Morale decision. 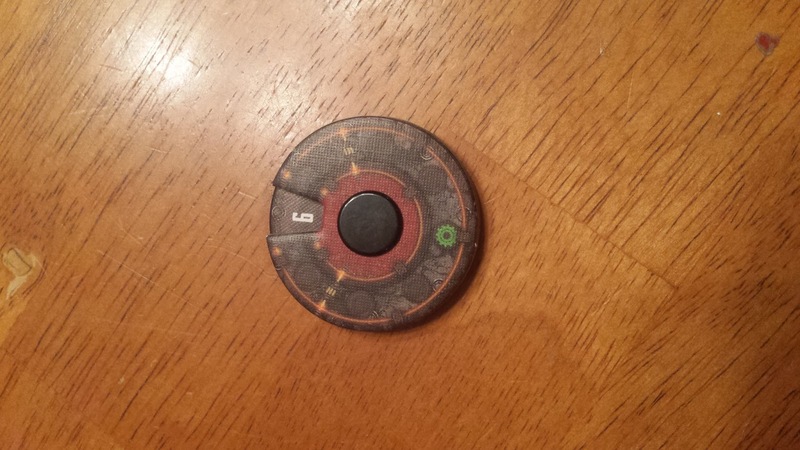 At the beginning of combat you can also add Reinforcement tokens to your army to help you survive as well. Reinforcement tokens are gained from using the Dominate action in a system where you control a planet which has them listed as an asset. Dice are only rolled at the very beginning of combat. So any units that are added in mid-mini-game are only there for Morale boosting and Hit Points to help you soak damage. The rest of combat is all about the cards. Your Combat deck is a small deck of 10 cards, which is actually made up of 5 different cards in pairs. You can customize your combat deck by using the Strategize order to buy new cards from you Combat deck upgrades. Adding in a bit of deck building action to the game. But like units, you have to meet certain Command Level requirements in order to purchase them. Once the Operations phase if finished it's on to the Refresh phase. A few different things happen during the Refresh phase. Here you'll be Collecting Objectives and Materials, Rallying Routed units, drawing Event cards and moving the Warp Storm tokens. First off you will collect Objectives. 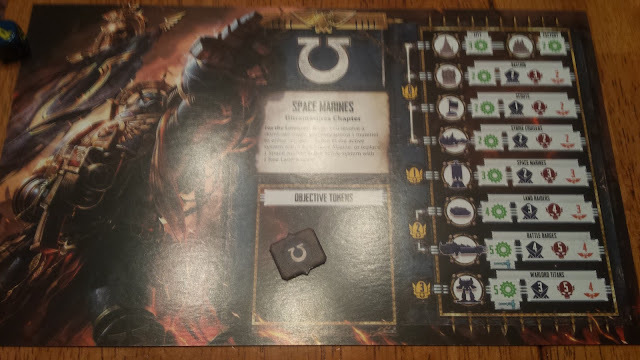 So if you're a successful galactic raider, like the Ultramarines above, you'd gain any Objective tokens that match your Faction in worlds you occupy. Then you'll collect Material. Most planets have a material total listed in their sector, some don't have any, but usually provide a decent amount of assets instead. You'll be tracking your Materials on a Material Dial, which is numbered from 0 to 14. Material is key to building your army and structures, you'll want to occupy as many planets as you can defend, so you can build up a stockpile and keep your war machine running. Then you'll Rally any Routed units you have, which is basically standing them back upright. They will then be able to once again contribute dice, Morale and card effects into combats, as well as be able to move again. After you've handled the Routed units, you'll draw an event card from your event deck. If you used the Strategize order during the Operation phase, you'll be able to keep the card and play its effects, depending on how many Strategize tokens are on top of the deck, you may be able to draw multiple cards. If you did not play a Strategize order in the round, you still need to draw an event card. The Event cards also have an icon on the right hand side of it. 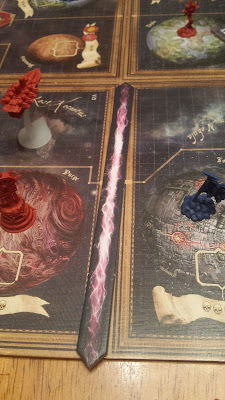 This icon denotes which direction you can move one of the Warp Storms on the board. You must choose between either of the two arrows. But you can never overlap Warp Storms, so if one is in the way, you are stuck going in the other direction. 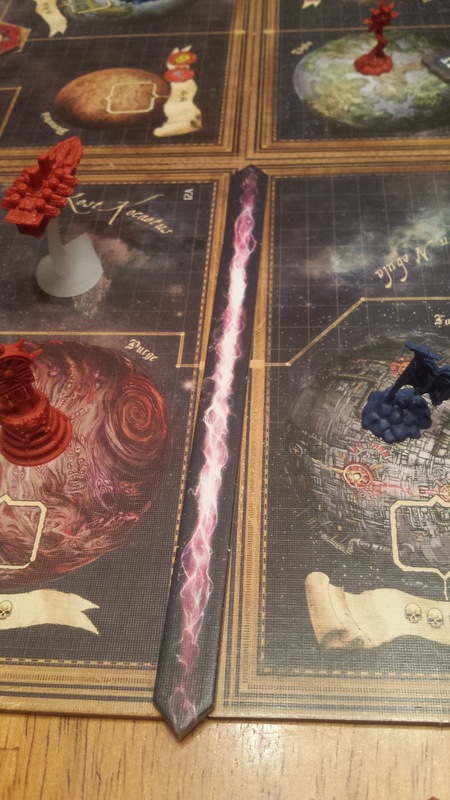 Warp Storms will dance all over the board over the course of the game and act as a random element. Just like Objectives, the more players in the game, the more Warp Storms will be dancing around. Warp Storms block passage between any adjacent systems along the edge they are located and it is even possible to block in one of the corner systems and make it inaccessible for an entire round. This can be either a blessing or a curse, depending on if you were plotting to head that direction or are hunkered down in that system, building your forces. 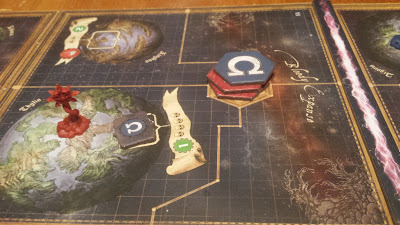 That's it, with the drawing of the Event deck and moving of Warp Storms, a turn is over and it's on to the next round. Overall, I really like what I've seen in this game. I've only had a chance to play it in a mock up game where I was running both factions. I really like the mix of strategy army building, area control, worker placement, deck building and guessing/ bluffing your opponent when placing Order tokens. The board, tokens and cardboard pieces are all nice and thick and well made. 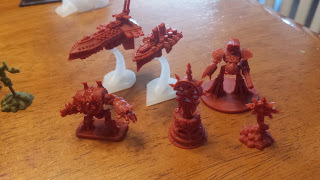 I did have a bit of warping on the Warp Storms and Round Tracker, but that's not a big deal to me. 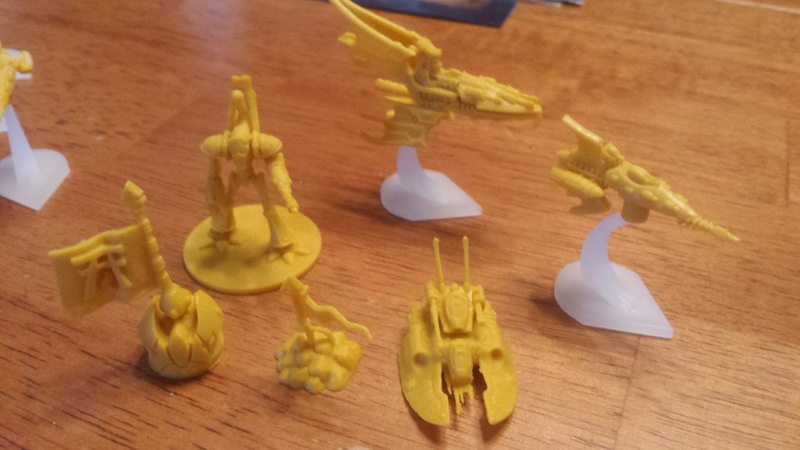 The miniatures are really nice too! There are tons of details on these things and they just been to be painted... I'm already getting egged on to put the brush to them from the folks on Twitter too. It's only a matter of time before this game gets the paint treatment, I'm sure. With all the structure and unit building, Forbidden Stars feels like a board game version of a Real Time Strategy video game. That seems fitting, since the basic mechanics are supposedly drawn from Fantasy Flight's previous StarCraft board game (I've never played it, so I don't know how similar they actually are). But either way, it works really well and it scratches my itch for a space game, and sates my urge to pick up Twilight Imperium 3rd Edition. 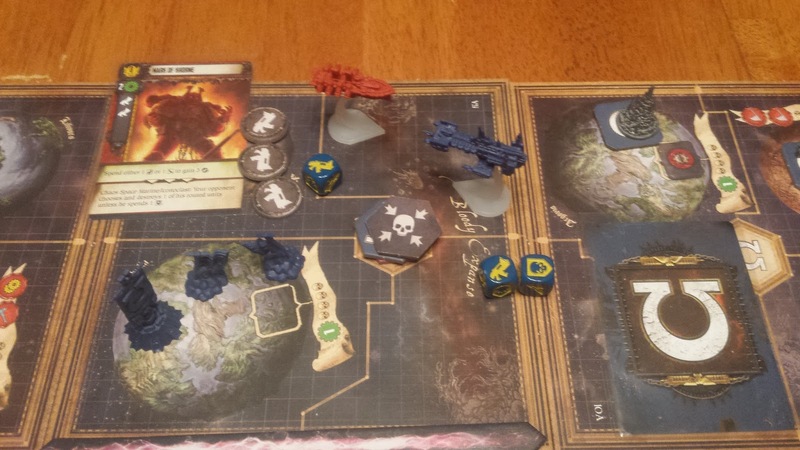 For now Forbidden Stars fills my space game slot, just fine. 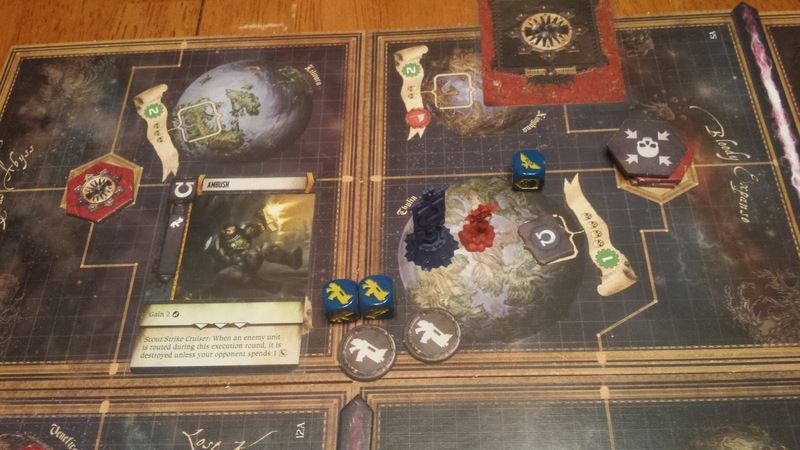 The Warhammer 40k universe is a nice fit as well and from what I can tell, each faction has different strengths and weaknesses and plays differently. It'll be fun to pit them all against each other in a 1v1 environment and see which faction handles which the best. I really like the combat system in the game, and it makes you think about how you can strengthen your Combat deck the most with upgrades and how each card will play in battle. You really need to pay attention to the entire card, since you're not only picking bonuses to offense, defense and morale. But you also need to balance the special effects with your force to make sure you get the most out of them. The only issue I can see with combat is that it is basically a mini-game between two players. So in a 3 or 4 player game, it will take them out of the game until combat is handled. On the other hand, that gives them time to look through their upgrades and strategize future moves while the other players are busy killing each other. With the modular board and ability to set up your forces on the board however you please, I can see a lot of replay coming out of this game. If you're a fan of the Warhammer 40k universe and like RTS games, I'd definitely suggest picking this one up. 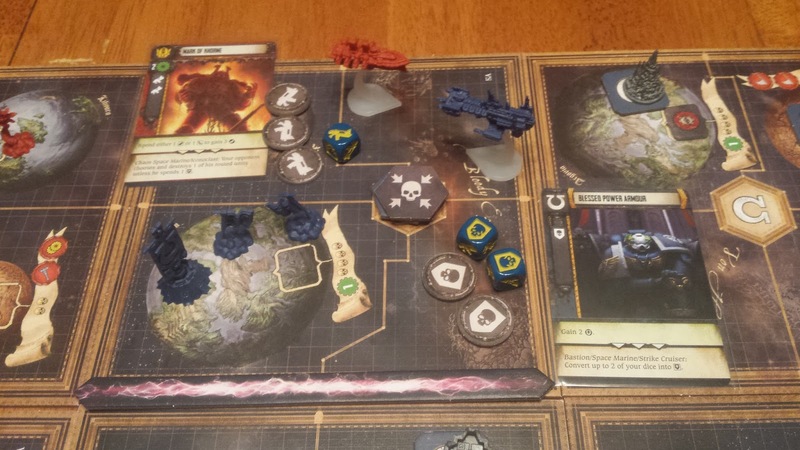 Even if you're not a fan of 40k, at least find a demo of it and see how you enjoy the gameplay, you might be surprised. That's all for now. Feel free to comment of question below, you can also reach me on Twitter @ryglore. If you're interest in finding out more about how the game is played, Fantasy Flight also has the rules available for download on their site. The Ultramarines beat back the Chaos taint in the Herakon Cluster and claimed it for the Emperor! Does it seem like there will be expansions to the game? 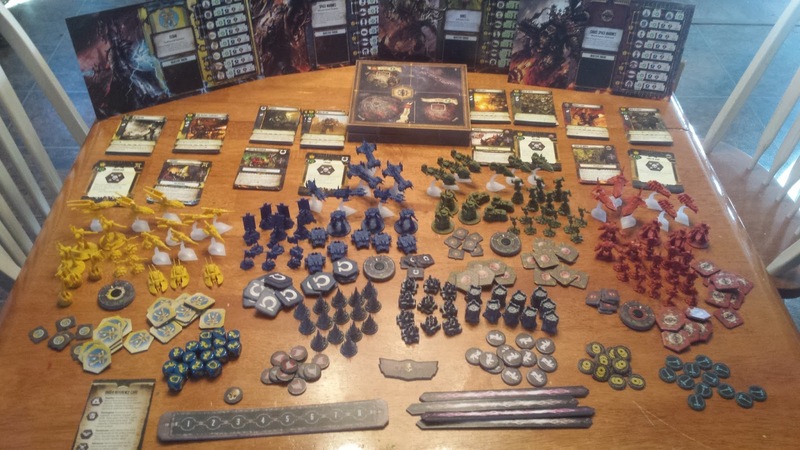 This is after all FFG... more units? more system tiles? More forces? I wouldn't doubt if there were expansions in the works already. 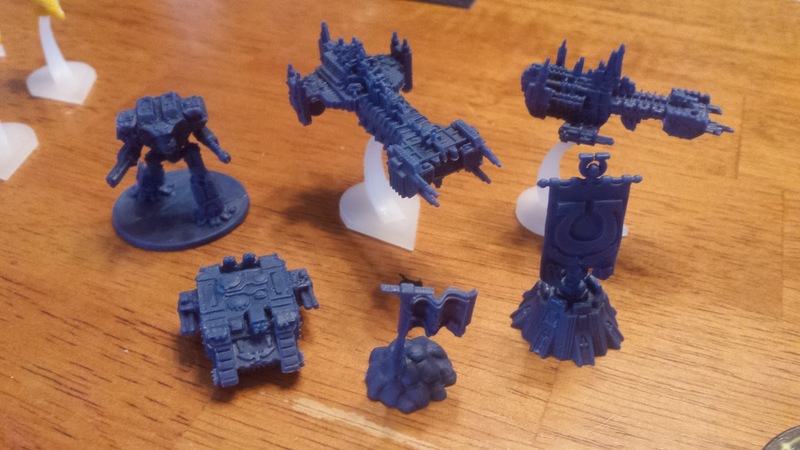 Fantasy Flight does like their add-ons, plus there are a bunch of factions to tap into yet. If they did do an expansion, I'd like to see it as a boxed one, with maybe 2-4 factions and new tiles too. Not sure if they'd add in more units though.